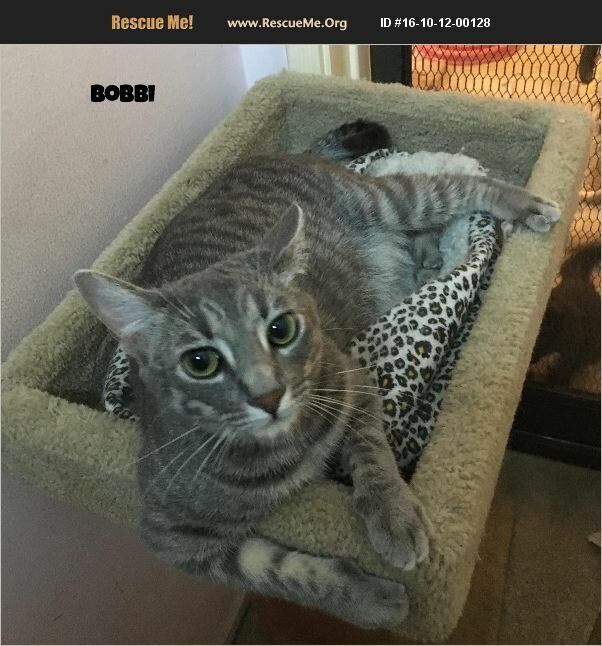 BOBBI, a silver grey and white tabby cutie, is still a young cat at one year old. She's a small girl with a big heart and very pretty. Although very possessive of her toys and her area if around other kitties, she is otherwise willing to share and play and be petted and be fed! She's only vocal when I first get home but once I've given her some love, she settles down with her treats and just keeps me company. Although playful and okay being around people she couldn't be considered calm if there are certain other kitties around. She would be happy in a home with someone who is kitty savvy because if she gets agitated she won't scare them with her kitty bites and scratches, not bad ones but definitely indications of being upset. What makes her agitated? Mostly being around some kitties in particular, some adult kitties. She seems to be a little better with youngsters that she can dominate. She gets along with some but not others because she thinks she is the queen! And she is! She's possessive of her toys and her space and doesn't want some of the other kitties in her way. She seems to tolerate some and not others. Bobbi is certainly food motivated - loves her Temptation treats! She's not a picky eater but is sure ready to eat as soon as it is spooned up - wet food and dry food; and please note that she is very polite with her litter box. She's also good about using a kitty scratching post and reclining in a kitty tree where she can snuggle into it and snag a hand for a pet anytime someone walks by. Bobbi always makes me laugh - she is so cute. And just wants to be loved. So, give her love and she will make you laugh, too!